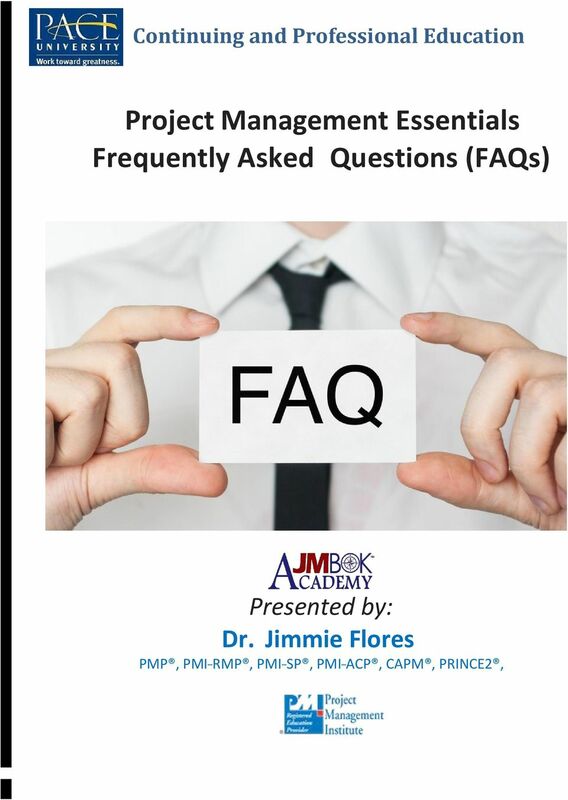 Download "Project Management Essentials Frequently Asked Questions (FAQs)"
2 What will I learn in the Project Management Essentials class? In this interactive class, students will learn the fundamentals of project management, including how to launch a project, manage scope, anticipate risks, lead stakeholders, and choose the best Project Management Institute (PMI ) credential. Project Management is designed is to help the organization increase revenues and to improve internal efficiencies. 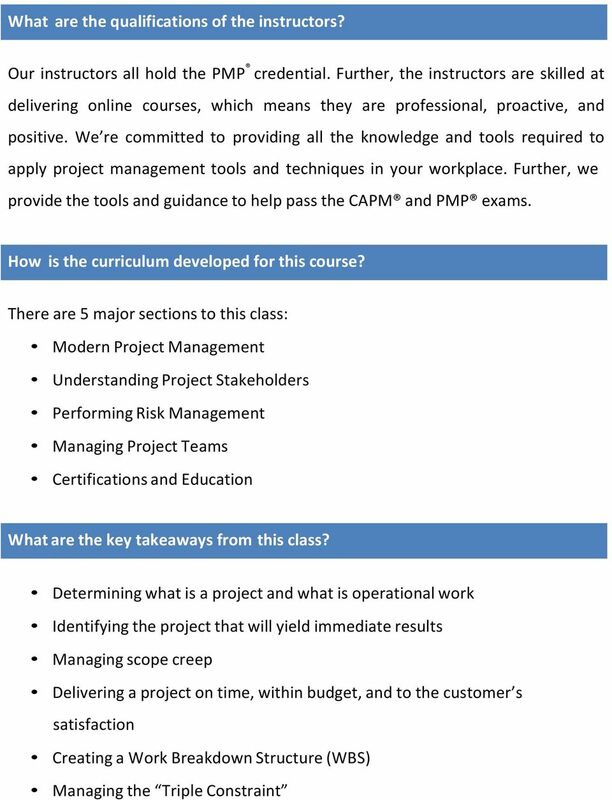 Upon completion of this class, students will have the skills necessary to become meaningful participants on projects, including how to become an effective Project Manager. What materials will I need to take this course? The materials you need for this course are provided as part of the tuition. Our teaching approach includes screencasts (recorded lectures), interactive discussion questions, checkpoints, and live sessions. How do the live sessions work? 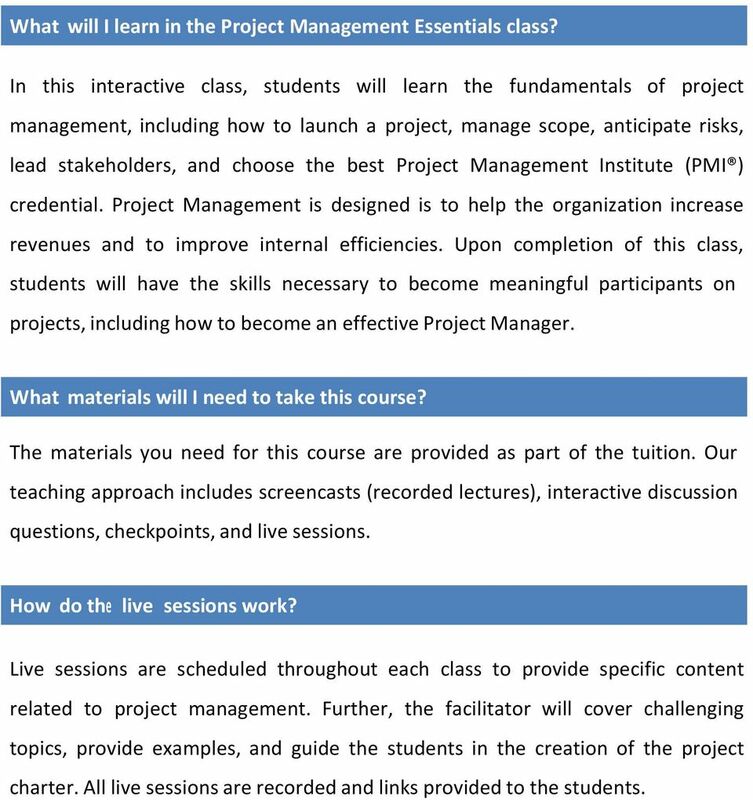 Live sessions are scheduled throughout each class to provide specific content related to project management. Further, the facilitator will cover challenging topics, provide examples, and guide the students in the creation of the project charter. All live sessions are recorded and links provided to the students. 3 When are the assignments due? Students are provided a course syllabus and course outline to help them follow along. The requirements for each week are provided, and the student s assigned Mentor will follow-up to help the student meet the expectations. What is the role of the course mentor? Each student is assigned a mentor, who will provide guidance and encouragement. 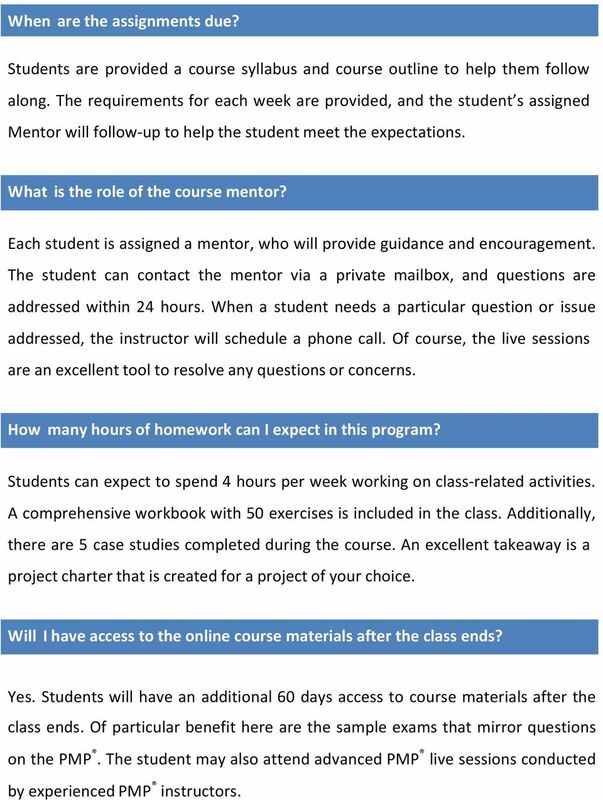 The student can contact the mentor via a private mailbox, and questions are addressed within 24 hours. When a student needs a particular question or issue addressed, the instructor will schedule a phone call. Of course, the live sessions are an excellent tool to resolve any questions or concerns. How many hours of homework can I expect in this program? Students can expect to spend 4 hours per week working on class-related activities. A comprehensive workbook with 50 exercises is included in the class. Additionally, there are 5 case studies completed during the course. An excellent takeaway is a project charter that is created for a project of your choice. Will I have access to the online course materials after the class ends? Yes. Students will have an additional 60 days access to course materials after the class ends. Of particular benefit here are the sample exams that mirror questions on the PMP. The student may also attend advanced PMP live sessions conducted by experienced PMP instructors. 4 How many continuing education units are earned from this class? After successfully completing this class, students will earn 16 hours of formal project management educational training. 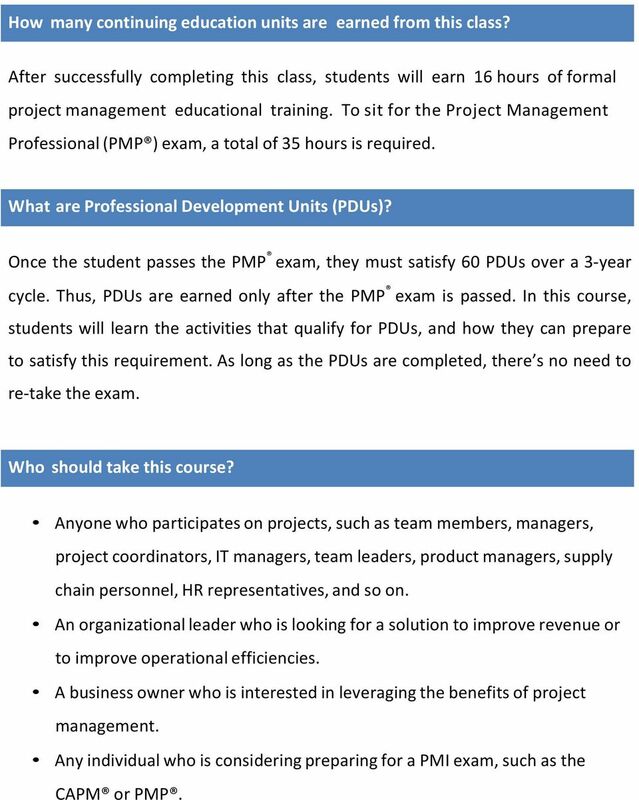 To sit for the Project Management Professional (PMP ) exam, a total of 35 hours is required. What are Professional Development Units (PDUs)? Once the student passes the PMP exam, they must satisfy 60 PDUs over a 3-year cycle. Thus, PDUs are earned only after the PMP exam is passed. In this course, students will learn the activities that qualify for PDUs, and how they can prepare to satisfy this requirement. As long as the PDUs are completed, there s no need to re-take the exam. Who should take this course? Anyone who participates on projects, such as team members, managers, project coordinators, IT managers, team leaders, product managers, supply chain personnel, HR representatives, and so on. An organizational leader who is looking for a solution to improve revenue or to improve operational efficiencies. A business owner who is interested in leveraging the benefits of project management. Any individual who is considering preparing for a PMI exam, such as the CAPM or PMP. 6 Maximizing the use of Lessons Learned Managing difficult stakeholders Improving accountability in the workplace Taking a proactive approach to risk management Getting the most out of teams including virtual teams Learning how to ask the brutal questions Managing conflict to get things done Getting the most out of project meetings Implementing a rewards and recognition system Deciding the right project management certification to pursue What does it take to qualify for the PMP exam? 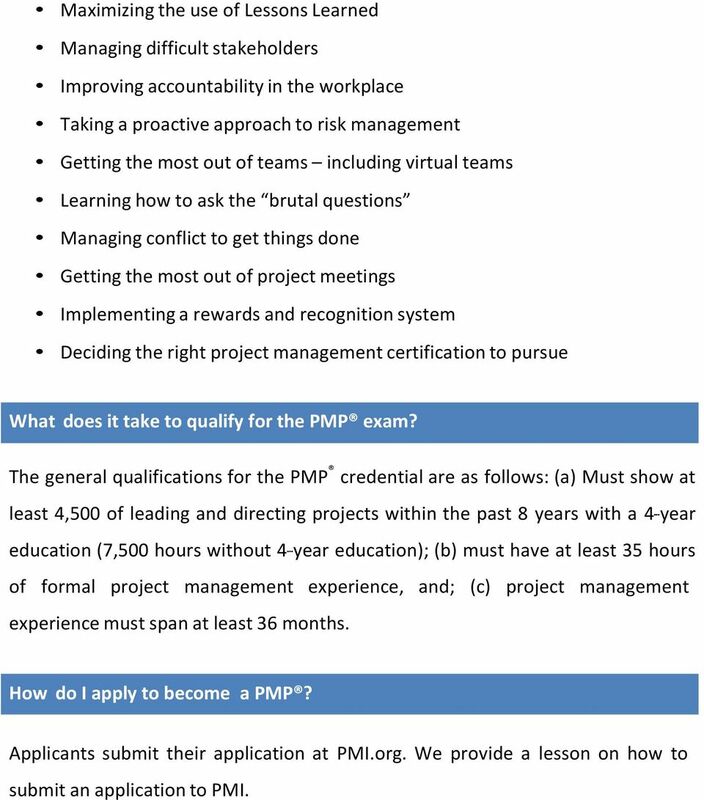 The general qualifications for the PMP credential are as follows: (a) Must show at least 4,500 of leading and directing projects within the past 8 years with a 4---year education (7,500 hours without 4---year education); (b) must have at least 35 hours of formal project management experience, and; (c) project management experience must span at least 36 months. How do I apply to become a PMP? Applicants submit their application at PMI.org. We provide a lesson on how to submit an application to PMI. 7 Should I take the Project Management Essentials class before the Project Management Intermediate and PMP Certification Prep courses? Completing Project Management Essentials will prepare you for the Project Management Intermediate class, which provides foundational knowledge for the PMP Certification Prep course. While not required, it is recommended to take the classes in this order. Mission Statement PM Mentors (PMM) provides high-value, project management training/consulting services and materials compliant with the Project Management Institute s (PMI s ) standards and best practices. Master s Certificate in Project Management and Advanced Course Offerings. SIGN UP TODAY! 412.963.1347 www.pmcentersusa.com. UNIVERSITY OF NEW BRUNSWICK. project management programs ADVANCE YOUR CAREER WITH INDUSTRY-LEADING TRAINING. www.unb. Austin Community College BMGT 1023 IT Project Management (IT Project+) Certificate Program <Term> <Year> ONLINE SYLLABUS Version 1.